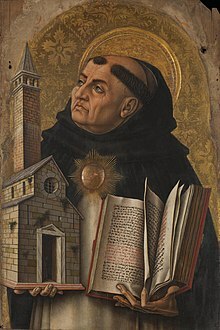 Thomas Aquinas, (1225 – 7 March 1274), Italy ke ek Catholic padhri rahaa. Uu philosophy aur theology parrhis rahaa. Catholic log ii maane hae ki jon koi priest bane maange hae ke khatir Aquinas sab se achchhaa teacher hae. Uske kuchh famous book Summa Theologica aur Summa Contra Gentiles hae. Aquinas,,Church ke 33 Doctors me se ek hae. Dher school ke uske naam dewa gais hae.